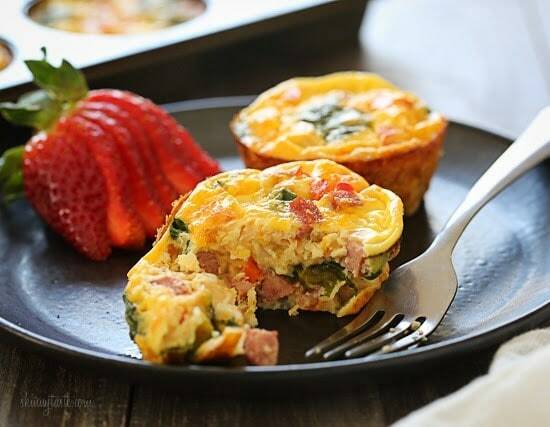 These petite crustless quiches are SO good, loaded with turkey kielbasa, veggies and cheese. A perfect make-ahead breakfast for meal prep and naturally gluten free! This slimmed down quiche will not disappoint. 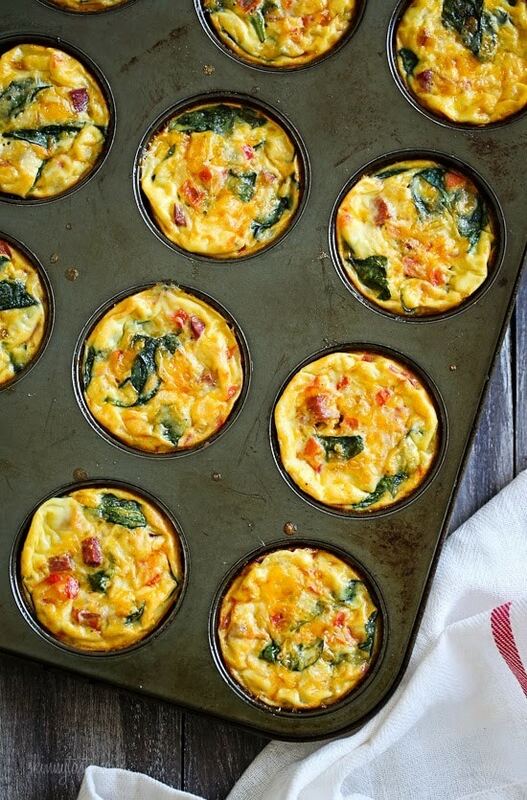 Make them ahead for grab-and-go breakfast for the week. Two muffin sized quiches are perfectly satisfying, and to be honest, who needs the crust? I also like this vegetarian crustless Broccoli Cheddar Quiche. You can swap the veggies for anything you like, and the kielbasa can be swapped with ham or sausage. I added some flour to the eggs, it gives the egg the perfect texture of a quiche, without the cream but if you prefer to make them low-carb, you can leave it out and add another egg. If you try these, let me know what you think and leave a comment below! If making these ahead, wrap them in plastic wrap in pairs or containers so you can just grab and go. These will last refrigerated 4 to 5 days, or can be frozen. To reheat, microwave about 1 minute. *For gluten free use GF all purpose flour. Heat the oil in a large non-stick skillet over medium heat. Sauté onions and salt for 5 minutes, until soft, add bell peppers, garlic, tomato, kielbasa sauté for another 5 to 7 minutes. Add spinach and cook until wilted, about 1 minute. Set aside. Meanwhile, in a large bowl, whisk the eggs, egg whites, milk, flour, salt and pepper until smooth. Add the cheese and cooked kielbasa mixture to the bowl and mix well. We loved the Petite Crust-Less Quiche. I just added one more ingredient to the flavor, 1/4 teaspoon of dry mustard. I also used Trader Joe Maple Link Sausage which added a mild sweetness. My daughter is milk intolerant so I made some without the cheese and she liked them and did not miss the cheese. I make these on Sunday afternoon each week, for my husband to eat on all week! He loves them! I typically use a chicken maple/apple sausage instead of kielbasa. I add a little hot sauce too! Thanks for all of the great recipes. These were really good and I had breakfast for the week.. i will make them again . These were so flavorful and perfect to make ahead for the week. I also made your salsa verde and used it as a dipping sauce for the egg omelets. It was so yummy! Please continue creating delicious recipes! These were amazing!! My entire family loved them!! Great flavor and convenience! Easy to make while you’re making dinner. 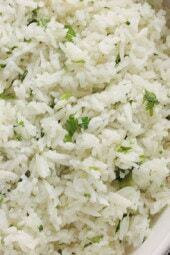 Delicious and very easy. I substituted 2 oz Canadian bacon for the kielbasa, finely chopped. Yummy! These looks so yummy. I will definitely try these today. Are they perfect for my son school lunch? what is the saturated fat on this one? hello what is the sat fat? it isnt listed and i am trying to calculate for weight watchers. thank you so much! 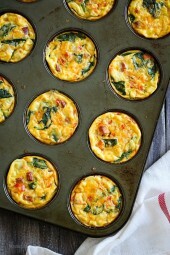 These are made every Monday (or your Western omelet muffins) and used for amazing morning breakfast or snack on the go! Thank you for this, and all your recipes and meal plans! If I wanted to make this with a crust, would I need to adjust the cooking temp or time? Or if I wanted to make this in a round cake pan instead of individual ones? Ho could you warm these up in a toaster oven? Absolutely amazing!! I’m always looking for a quick breakfast for busy weekday mornings and this fits the bill!! I have issues a lot of times with egg muffins because I don’t prefer the consistency. The addition of milk and flour in these muffins makes them a perfect “egg muffin” combination! The flavor was on point and they were incredibly easy to whip up. The nice thing about these is that you can alter the veggies to give yourself some variety. I baked mine in cupcake liners; as I’ve dealt with eggs sticking to muffin tins and didn’t want to deal with the clean-up. Super easy; super delicious! Highly recommend! Could you use regular bacon in the receipt instead of the turkey kielbasa? How would that affect the points? Thank you. I always have trouble getting eggs out of the muffin pan, so now I use parchment paper cupcake liners. The parchment paper falls away after taking them out of the oven, perfect to eat or freeze. Just made them again this morning using oatmeal instead of flour, fat free cheddar cheese and got the count down to 2.5 points per muffin. Every point counts! Love these! Thanks, Gina. Now on to making your new chicken and noodle soup using thighs, my favorite! I have made many different types of egg thingies in muffin tins, but this was my favorite so far. The flour and milk seemed to help the texture. I made mine in heart shaped tins, and they were over-full though. I did not use the evoo, I just used non-stick spray on the veggies. I used Garret Valley brand turkey kielbasa. Will make again for sure. What do you put in the muffin tin so they don’t stick? Everytime I make them, it makes a complete mess. Maybe I need a new muffin tin? These are absolutely amazing! This will be a new favorite in my house! Thank you so much for such delicious recipes! You’re welcome Whitney! Glad you enjoyed them! Gina another WINNER you created! This is a great way to use up some items in the fridge and they travel so well. Any thoughts on writing a Skinnytaste gluten free cook book soon? With the millions of people that can not eat gluten we are in need of your winning recipes!! Keep up the great work you do, many of us go to your website for yummy ideas on a regular basis. These are absolutely delicious! I make them every couple of weeks and freeze the leftovers. They reheat perfectly in the microwave. I bake them in silicone muffin cups and no longer have a problem with them sticking to the paper liners. Thanks Gina for the wonderful recipe! Love these and I love that you can change them up to your taste! Tried them with smoked turkey, baby kale instead of spinach and next time will try them with gruyere cheese. NOTE: the one thing i did learn–the hard way–is the best way to get the yummy egg mixture into muffin pans was by spooning the mixture in with a large spoon. Pouring from the bowl definitely did NOT work well. I’m sure many of you already knew that so this is for the first tiimers like me! Thanks for the tip Deb! I’ll be making them for the first time tomorrow. Are the nutrition facts listed somewhere? These are great. They’ll be my go to breakfast! I agree that the flour really improves the texture. When i made mine today, I used 10 whole eggs as I really didn’t have use for the egg yolks and they can out wonderful. It will change the nutritional value, though. If that isn’t a factor then go for it! I just made these for an early Easter Brunch and they were Awesome! I did exchange reduced fat sausage for the kielbasa, but it was a huge hit! Thank you for always have healthy and yummy recipes. I've had problems with sticking in past. I solved by using cupcake liners in muffin cups and I spray them before adding the egg mixture. Do you use the mini muffin tin or the regular size muffin tin? I have that same question. Does anyone know? Looking at the picture, I would say she used regular sized muffin tins but I don’t think it would matter if you used the mini-muffin tins as long as you adjusted the time accordingly. I have the same problem with the sticking but another commented suggested the silicone pans for these and probably the mini omelets as well. Unfortunately, I still need to invest in a silicone pan lol. Do you know if the temperature and time would be the same for using a silicone pan? These were delicious!! Mine didn't pop out of my muffin tin though and I even sprayed them with an olive oil cooking spray. I do have a silicon muffin tray…should I use that? Or any suggestions for getting them to come out without sticking? Love all your recipes…they are SOOO good and healthy. Thank you! These turned out great! They actually seemed tastier reheated from the fridge. Perfect healthy, portable hot breakfast. Thank you so much for this recipe. Had these for dinner tonight. Delicious! I'm excited to use the leftovers this week as quick and easy breakfasts. I made these for Christmas morning and the left overs kept me out of trouble for the remainder of the holiday week. Just made up a new batch with the leftover New Years ham. These are easy and delicious! Would love to know someone's all veggie version. Just made these, SUCH a fan! My fiance loves them and says they're our quick fix to having a fancy breakfast in the morning. We ate them this morning with a side of arugula and a little Trader Joe's Cilantro and Chive yogurt dip. I made these for Christmas morning. As Gina said, you can make them a couple days ahead, and pop them in the microwave. They were fantastic! I will be making these again for sure! I'm paleo and just made it with almond flour, almond milk and no cheese. They were still awesome! 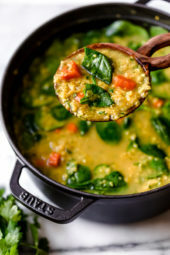 Did anyone try a veggie version? What can I use to make up for the volume of the kielbasa? Made these on Sunday for the work week and they are great! I just pop them in the microwave and breakfast is ready! The pickiest eater in our family (our 13 yo daughter) loved these so much she asked me to make them again! Love your recipes, Gina! They never fail to please the entire family. 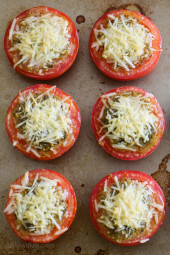 BTW I make these ahead during the day then just toss in the oven come dinner-time. Good time saver on busy school nights. How would you suggest reheating these in the oven, at what temp? I don't have a microwave. Thanks much. If you use asparagus, do I need to par boil or blanche it? Thanks. How long do you let cool in the muffin pan before removing them? I ended up substituting things I got in my CSA this week (like kale and swiss chard for the spinach) and used a chicken brat because it was leftover from last night. In the oven right now! Could I make the night before, refrigerate and then stick in the oven the next morning? I looked and didn't see this question asked (of course I could have missed it)…but could you make this full-sized? In a 9-inch pie plate, for example? Would love to hear thoughts! How would you adjust for 9 x 13 for potluck? I made these a few days ago, and I think this recipe will be a new favorite for week-day breakfasts. So yummy! I made these over the weekend and they are fabulous! They reheat really well for weekday breakfasts! Thank you so much for all of your wonderful recipes! I have loved every one that I have tried! Would this work with only whole eggs ? I hate wasting yolks… if I see no use for them in the near future. I just wanted to clarify where the salt should go? It says to sauté onions and salt and then it says to add the salt in with the eggs. I only salted once with the onions…they aren't out of the oven yet but they smell fantastic! I know this might sound silly but I'd like to make this for dinner. What can you recommend as a side to someone on Weight Watchers? I am planning to make these for dinner and have them with a large green salad, lf dressing and make some LF oven chips to go with them. Just cut up a potato into chip shapes (skin on or off) par boil for 5 minutes before tranferring onto a pre-heated oven tray with spray oil, spray the top of the chips and cook for around 30 mins on around 400f. These are absolutely delicious! Made them for breakfast this morning. Even my husband loved them and he hates quiche…I did use Jimmy Dean Hot Sausage, drained the tomatoes and diced the spinach. They were perfect. Will make this over and over again. Great for company, snacks, appetizers any time. Thank you so much for your wonderful recipes, Gina. These were yummy! I used 3 oz. of turkey kielbasa and 3 oz. of healthy choice ham. I also combined the cheddar cheese with mozzarella and substituted broccoli instead of spinach! What could u substitute for the flour?? Would almond or coconut flour work? Using these for weekday breakfasts was such a great idea- thanks! High protein quick breakfast, you can also try it with Canadian bacon! Made these yesterday and they are delicious. Even my adult sons asked if they could have them for breakfast. One comment – I did overfill the muffin cups slightly thus getting spillage. Probably should have put the muffin pan on a baking sheet. Thanks for adding that. I was worried this would happen to mine just now as they are cooking. I looked in the oven and they were just getting ready to spill. I stuck a cookie sheet on the oven rack below it to catch drips. If only I'd thought to line the sheet first, my clean up would be super easy! Where did you get that darling whisk? Thanks. Thanks for sharing this! We're looking forward to trying them out! This looks delicious! Can't wait to try making them! Will it change it very much if I use egg beaters for the eggs/egg whites in the recipe? I make these all the time, they're the best! Love your version, Gina. Definitely going to try it out! Lay them out on baking sheet and freeze them. Once frozen, you can wrap in plastic wrap individually ect. Or use a seal a meal. Yummy! I like knowing that your muffin pan is as worn looking as mine is! These look terrific, but I always seem to have trouble getting things like this to release from the muffin pan; it seems there just isn't quite enough spray there. Any suggestions? I have had good luck using a silicone muffin pan or silicone cupcake holders when making recipes with eggs. No need to spray them & they pop right out after being allowed to cool 5-10 minutes. Very easy cleanup! I love using the USA Pans 12 Cup Cupcake/Muffin Pan, Aluminized Steel with Americoat. I don't grease them and the quiche cups pop right out. What is the best solution to revise this recipe to a low-salt version? It looks great but I have been cautioned to cut the salt. I would simply omit the added salt. Turkey kielbasa is high in sodium, but if you can either swap it for another meat (like homemade salt free turkey sausage, ground meat, or chopped chicken or turkey) or omit that as well and add a little bit of extra veggies instead. I believe that what you are really making is a frittata, not a quiche! A frittata starts on the stove top and finishes in an oven. Quiches (whether with or without crust) are cooked entirely in the oven. The absence of the crust doesn't turn it into a frittata, it's the cooking method that determines what it is. Either way, what does it natter what it is called if it tastes good? Has anyone used egg substitute (i.e. egg beaters) instead of real eggs? Did it work okay? Yes you can use egg beaters ect. Try to find the organic types, made from cage free chickens. Thank goodness, as eating healthy now a days requires I only use egg whites. Glad to find this recipe and will substitute asparagus and mushrooms for some of the veggies. I made these last night and they were really good! The family heated them up this morning and loved them as well! Keep the recipes coming! I ADORE quiche, but I adore it ALL THE MORE when it has no crust, and saves about 1000 calories. Plus, that means more protein packed goodness for my breakfast! Pinning! These look fantastic! I love quiche, will definitely add these to my must make list! Definitely trying this. Looks simple and delicious, my kinda' meal. 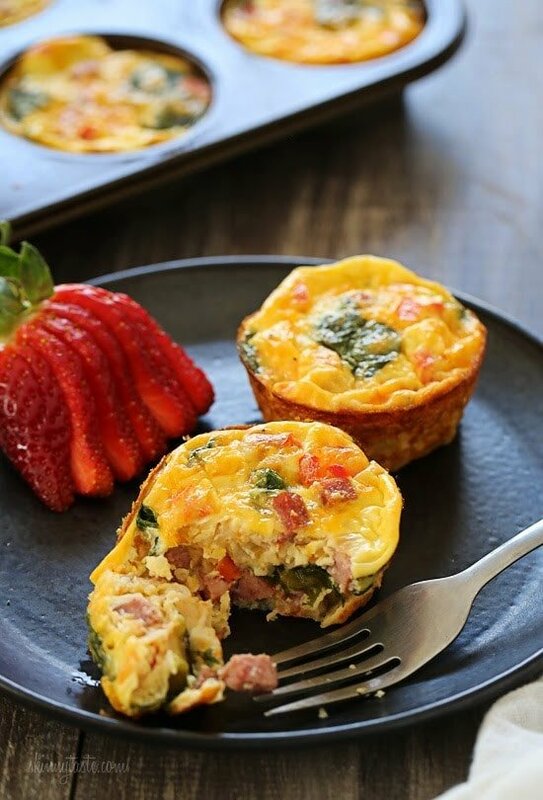 I have made egg muffin type quiches like these never using any flour, and they're just as good. I'm going to try them with protein powder next time. Yes but the texture is better with the flour in my opinion. I’m going to make these today but think I’ll use ground oatmeal as its more healthier but also no count on uk WW. Thank you for sharing your recipes. ???? Can these be eaten cold? They look great to take on a plane. What a great sounding recipe. Can't wait to try it soon. Thanks! I think I'll do half of these in a muffin pan and the other half in a muffie pan (makes the large muffin tops). I'll be able to eat the regular quiche version while the muffie sized ones will be perfect for hubs to put on a bagel thin for a sandwich. Win-win! oooooo I need a muffie pan! what a great idea! Just reheated them from the freezer this morning. They still taste great! I reheated them at 60% power for 2 mins. Looks delicious and seems simple enough to make! I've been wanting to make crustless quiche for a while. You can make crustless quiche in a glass cake pan just put in any ingredients that u want then pour your milk n eggs over it. Bake 325 degree oven till done. Unzip my pants and find out. They said kielbasa, not cocktail weenie. Looks delish!! Could I substitute with coconut flour? Or not use the flour? oh i love quiche. one of my go-to's throughout the week. and i agree turkey kielbasa is one of my favorite ingredients for quiche! looks delicious and love the idea of putting them in cupcake tins.